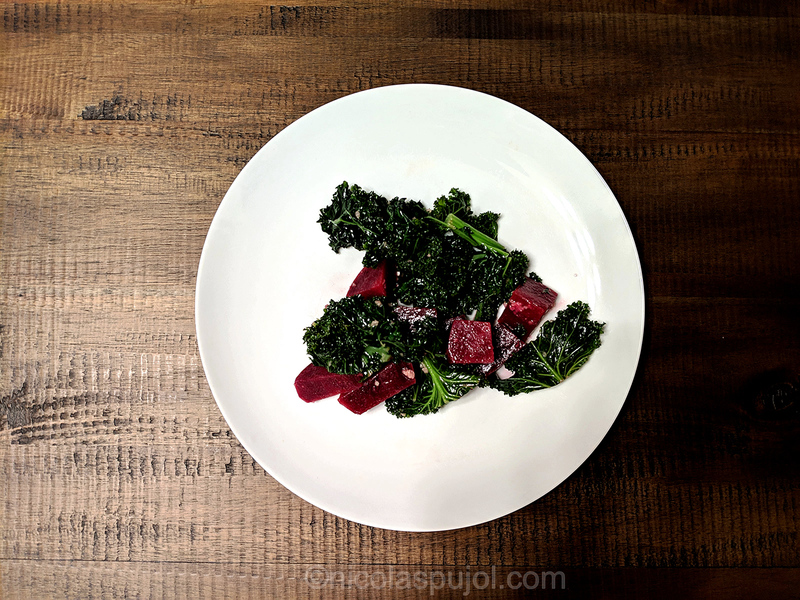 Tonight I wanted to make something nutritious, colorful and tasty, hence this beet and kale salad. 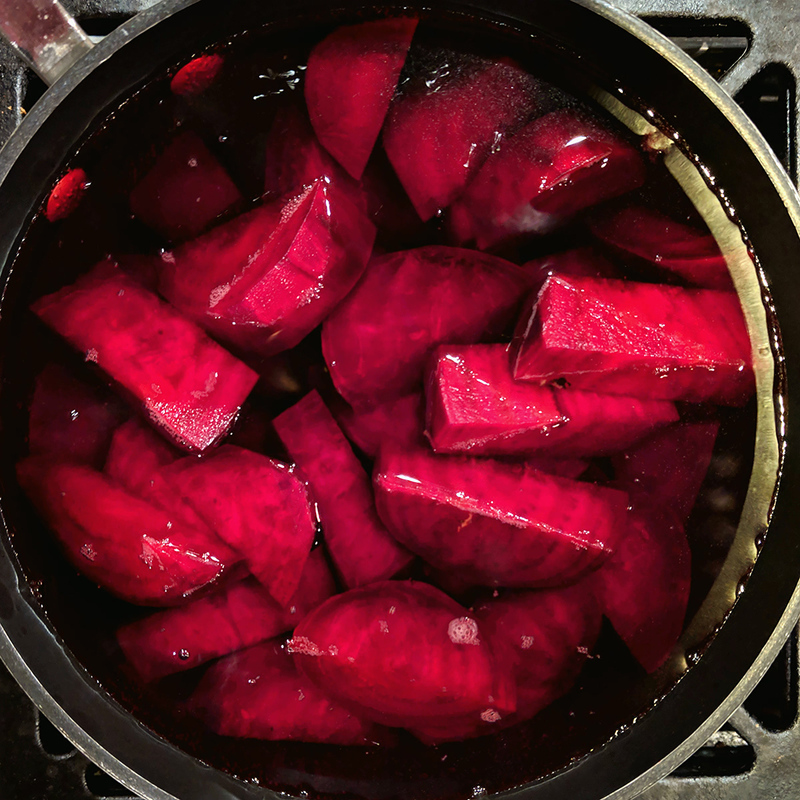 By themselves, beets provide a full array of red, pink and purple depending on what you look at: the vegetable, the water it cooks in, the white cutting board which is no longer white, or your hands after preparing them. At any rate, beets represent some of the most wonderful ingredients and are packed with nutrients. Some of these include folate, manganese, copper, fiber, potassium, phoshorus, betalains (which give them their color) and other antioxidants. One thing that is often mentioned is that you should not overcook beets, at the risk of losing many of these antioxidants. At the same time, eating them raw is not recommended either as they are hard, crunchy, hard to digest and as a root vegetable, meant to be cooked. You can make a beet salad with just this one main ingredient and a dressing. 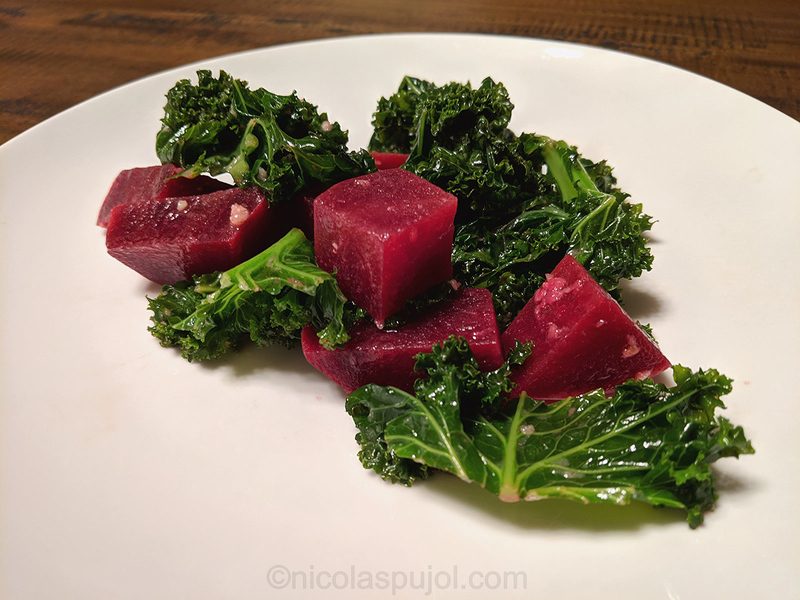 Since we also had fresh kale, I thought that the green color from kale would make a nice combination with red tones, and the flavors would complement one another. 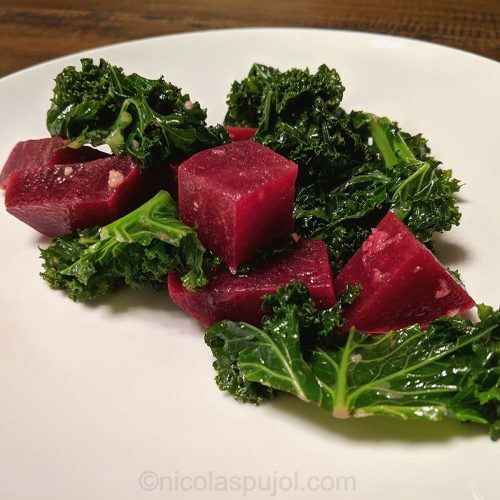 So I cut a few stems of kale and lightly cooked them to make them less hard and crunchy – just like beet. Lettuce is by nature soft, but I find that kale tastes much better when lightly steamed or cooked. Timing is everything: not too little time, not too long. Once this was done, the rest was easy, since my classic French lemon and olive oil dressing adds itself to most salads. This one was no exception. You can make the dressing without mustard if you’d like, to emphasize the freshly squeezed lemon and olive oil with these two vegetables. The salad was a dinner, which would have been fine on its own. We were a tad hungrier, so I paired it with a simple black bean and red onion combo in the pan (with a bit of avocado oil, salt and cumin). This made our vegan meal. 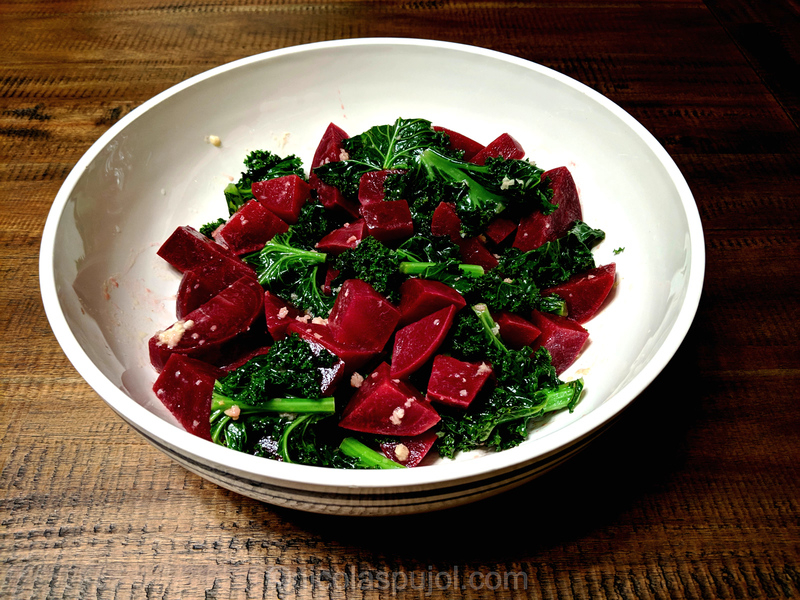 This beet and kale salad is easy to make and packs natural flavors and nutrients. It is paired with a French lemon dressing using garlic and olive oil. Bring water to boil in a mid size pan. Peel the beets, rinse them and slice them into bite size pieces. Cut and remove an inch of the kale stems at the bottom, rinse well and cut them. Put the beets in the boiling water and cook for 15 minutes. 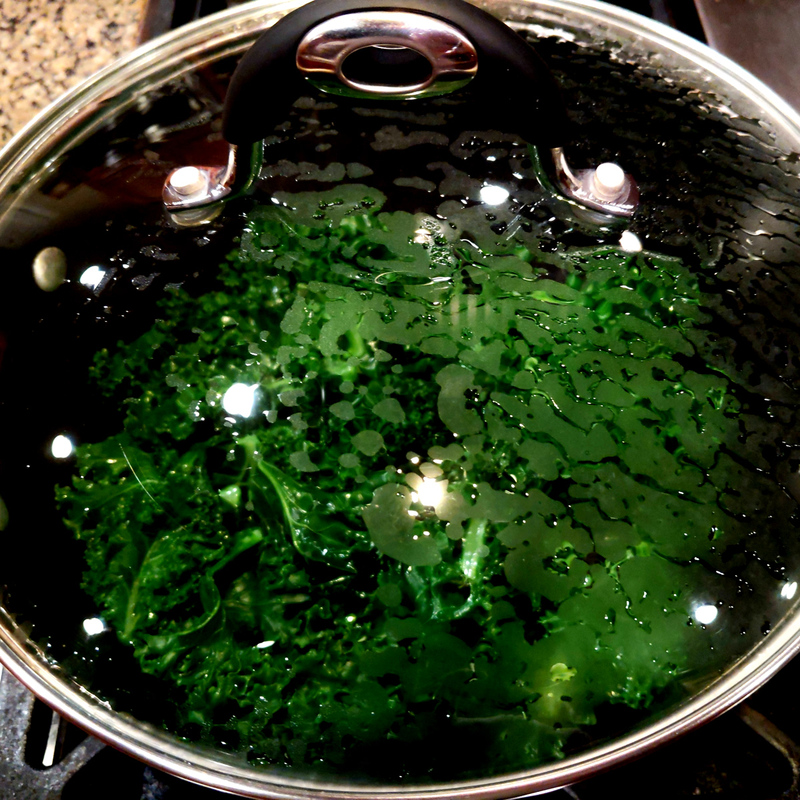 In another pan, heat the avocado oil on medium level, add the kale and cover with lid. Stir gently after 3-4 minutes then lower heat to simmer. Finish slow cooking the kale for a total of 10 minutes. In the meantime, prepare the French lemon dressing. Strain the beets, then fill the pan with cold water and place the hot beets in it to cool them down a bit. Let them rest for 2-3 minutes. In a large salad bowl, place the beets, add the kale and the dressing. Mix well and serve immediately.